Deep in the mountains of Carpathia lies the mysterious and mythic land of Transylvania--a world where evil is ever-present, where danger rises as the sun sets, and where the monsters that inhabit man's deepest nightmares take form. Innovative filmmaker Stephen Sommers--who so imaginatively re-envisioned Universal's classic Mummy character in the worldwide blockbusters "The Mummy" and "The Mummy Returns"--now widens his cinematic scope and multiplies his creative inspiration by breathing new life into the most time-honored pantheon of classic Universal monsters and setting them in a stunning new world of fantastical reality. Sommer's all-encompassing vision for a world as tangible, real and visceral as any caught in the stranglehold of inescapable evil blends the recognizable and the unimaginable into a vivid, epic backdrop for his tale of ultimate evil against a lone force of good: Van Helsing. Audiences will be drawn into a visionary, supernatural but seemingly all-too-real world of Sommers' singular creation--set in 19th Century London, Rome, Paris and Transylvania--where mankind is in constant danger from incarnate evil in a multitude of forms: monsters that outlive generations, defying repeated attacks from the doomed brave souls that challenge them in their never-ending war upon the human race. In Sommers' hands, Dracula, Frankenstein's Monster, the Wolf Man and others are effectively reborn as dynamic heirs to the traditions handed down by the filmmakers of the classic Universal monster pictures. Honoring their legacy while propelling them into the next generation of cinema, Sommers turns what was once classic into cutting edge. Into this world, brought to life and played out on massive sets and sweeping locations, Sommers brings Van Helsing (Jackman), the legendary monster hunter born in the pages of Bram Stoker's Dracula. 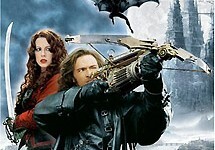 In his ongoing battle to rid the world of its fiendish creatures, Van Helsing, on order of a secret society, travels to Transylvania to bring down the lethally seductive, enigmatically powerful Count Dracula (Roxburgh) and joins forces with the fearless Anna Valerious (Beckinsale), out to rid her family of a generations-old curse by defeating the vampire. Also populating Sommers dense canvas are: Tony Award winner Shuler Hensley as Dr. Frankenstein's misunderstood monster; former Matthew Bourne company leading dancer Will Kemp as Velkan, Anna's stalwart brother who transforms under the full moon into the Wolf Man; Kevin J. O'Connor as Dr. Frankenstein's loyal yet treacherous assistant, Igor; David Wenham as Carl, a friar entrusted with ensuring Van Helsing's safe return; and Elena Anaya, Silvia Colloca and Josie Maran as Dracula's three bloodthirsty brides who will stop at nothing to help their master in his plan to subvert human civilization and rule over a world of havoc, fear and darkness.